Renault, Chrysler, Faraday Future, EPA, China, South Korea. 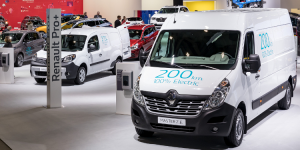 Renault Master electrification: The French are not only showing their new Kangoo Z.E. with 270 km range at the Brussels Motor Show, but also premiered the electric version of its transporter van Master. The latter will arrive at European dealers towards the end of the year and will be fitted with a 33-kWh battery pack that allows for a range of 200 km according to NEDC, even though 120 km are a more realistic estimate. Naming explained: Faraday Future explained the naming of its models. The FF 91 got its label, because the cars are named after size and price using the number 1 through 9. The 9 therefore stands for it being a top model, while the 1 indicated it being the first generation. Future cars could therefore be called FF 92, 81, 71, etc. Lowering emission targets: Just ahead of Donald Trump’s inauguration, the EPA confirmed greenhouse-gas emission targets for light utility vehicles through 2025. Despite bickering from manufactures, the Corporate Average Fuel Economy (CAFE) goals for 2025 are 54.5 mpg. The EPA says manufactures have enough technology at their disposal to comply. Cutting subsidies: The Chinese government wants to reduce subsidies for EVs through 2020, starting with a 20 percent cut this year. The country now also confirmed that electric or plug-in hybrid buses will receive no more than 300,000 yuan in aides (previously 600,000 yuan), while exact subsidies are based on the buses’ energy density and charging capacity. Trucks and specialty vehicles only get 150,000 yuan and local funding has been capped at 50 percent of state aide. 10-hr rule up for discussion: According to Reuters, the South Korean government is reconsidering its previous rule that EVs will only receive funding, if they can be charged in less than ten hours using a regular Schuko-connection. Especially Tesla would benefit, as its battery packs are too pick to comply. CHAdeMO Association hits new milestone.